Casa Romantica Cultural Center and Gardens, the historic Spanish Colonial Revival estate of San Clemente founder Ole Hanson, embodies the Romance and Reality of the Southern California experience. Established in 1966, The Cabrillo Playhouse came from humble beginnings as the San Clemente Community Theatre which was originally established in 1953. Each season, they proudly provide quality live theater productions include musicals, dramas and comedies. Popular with surfers on the north end of the one-mile beach. Other popular activities are skin diving and hiking along the trails on the bluffs. The beach has a landscaped bluff top with picnic areas. Trails lead down to the beach, which is also popular for body surfing, swimming, and skin diving. Amenities include rv Hookups, rv dump station, showers, horseback trails, nature trails, family and group campsites, beach access. San Onofre State Beach features 3.5-miles of sandy beaches with six access trails cut into the bluff above. The campground is along Old Highway 101 adjacent to the sandstone bluffs. The beach is popular with swimmers and surfers. The park includes a marshy area where San Mateo Creek meets the shoreline and Trestles Beach, a well-known California surfing site. Whales, dolphins and sea lions can be seen offshore from time to time. The park's coastal terrace is chaparral-covered. San Clemente catches swells all year long. Going from South to North, they include Trestles, North Gate, State Park, Lost Winds, Riviera, Lasuen, The Hole, Beach House, T-Street, The Pier, Linda Lane, 204, North Beach, and Poche. 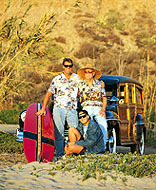 San Clemente is also the surfing media capital of the world as well as a premier surfing destination. It is home to Surfing Magazine and The Surfer's Journal. The pier is 1,200 feet long and was built in 1928. It's a wonderful spot to take a stroll, watch the surfers, fish off the side or enjoy a meal at the Fisherman's Resaurant and oyster bar.